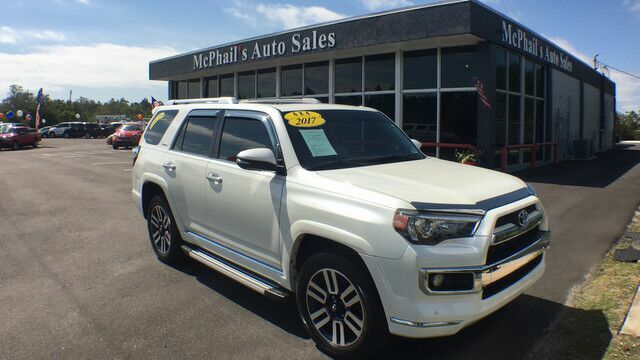 Mcphail's Auto Sales has a wide selection of exceptional pre-owned vehicles to choose from, including this 2017 Toyota 4Runner. This Toyota includes: ALL WEATHER FLOOR MATS Floor Mats LIMITED PACKAGE CARGO NET (PPO) BLIZZARD PEARL CARGO NET CARGO TRAY (PPO) BLACK, LEATHER SEAT TRIM Leather Seats UNIVERSAL TABLET HOLDER (PPO) ALLOY WHEEL LOCKS (PPO) Wheel Locks STANDARD PAINT BALL MOUNT (PPO) REQUIRES Tow Hitch *Note - For third party subscriptions or services, please contact the dealer for more information. * When you purchase a vehicle with the CARFAX Buyback Guarantee, you're getting what you paid for. Looking for a one-owner vehicle? You've found it. CARFAX shows this vehicle was owned by the original buyer. Do so much more with one vehicle. This Toyota 4Runner gives you everything you need an automobile to be. You appreciate the finer things in life, the vehicle you drive should not be the exception. Style, performance, sophistication is in a class of its own with this stunning Toyota 4Runner. Take home this Toyota 4Runner Limited, and you will have the power of 4WD. It's a great feature when you need to drive over tricky terrain or through inclement weather. It's not often you find just the vehicle you are looking for AND with low mileage. This is your chance to take home a gently used and barely driven Toyota 4Runner. Added comfort with contemporary style is the leather interior to heighten the quality and craftsmanship for the Toyota 4Runner Rest assured, this vehicle was well care for. In fact, previous service records are included. Clean interior? How about flawless. This Toyota 4Runner looks like has never been used. Treat your family to the joy of a vehicle with a super premium entertainment package like the one found in this vehicle. Get more for your money with this well appointed vehicle, including a factory warranty. Speed is a game changer and this awesome machine is so fast it didn't just change the game, it rewrote all of the rules. Treat yourself to a Toyota 4Runner that's got it all. Nearly every option is packed into this beautiful ride. With an efficient and easy to use navigation system, this Toyota 4Runner will help get you from Point A to Point B in no time flat. The handling and stopping power of this Toyota 4Runner is enhanced by the recently replaced tires. One look at the paint on this car and you'll swear even birds honor a no-fly zone around it. If you're looking for a one-of-a-kind automobile, look no further. This Toyota 4Runner comes equipped with hard-to-find custom wheels.